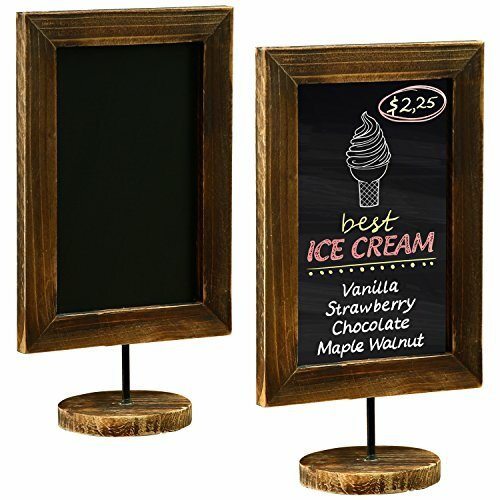 Providing both decorative accent and practical reusable signage, these burnt wood-framed chalkboards are perfect for cafés, bakeries, and retail shops looking for a stylish way to display menus, advertise specials, and indicate pricing. The 12 x 6 inch size offers a great balance of visibility and portability for use on countertops, shelves, and display tables. The dark chalkboard writing surface provides good contrast for artwork or messages, and erases easily to make way for new displays. Let customers know about sales and specials while enhancing your store's decor with these torched wood-framed tabletop chalkboards. 12-inch tall tabletop blackboard sign with a burnt wood-finish frame and round base. Burnt wood finish provides a stylish complement to a variety of rustic and contemporary café and retail decors. 12 x 6 inch size offers a combination of visibility and portability for use posting sales, specials, and menu items at service counters and display tables. Approximate Dimensions (each chalkboard, in inches): 11.8 H × 6.7 W 5 3.9 D.